“You Greeks are children.” That’s what an Egyptian priest is supposed to have said to a visiting Greek in the 6th century BC. And in a sense he was right. We think of Ancient Greece as, well, “ancient”, and it is now known to go back to Mycenaean culture of the second half of the 2nd millennium BC. But Egyptian civilisation is much earlier than that: in the mid 2nd millennium BC it was at its height (the “New Kingdom”), but its origins go right into the 3rd millennium BC or even earlier. Egyptians and Greeks are known to have been in contact already in the 2nd millennium BC, though we don’t know much about it. The picture becomes clearer from about 600BC, when the sea-faring Greeks were frequent visitors to Egypt. Some of it was for trade (there was a Greek trading-base at Naucratis in Egypt from about this time), some of it was about military services, and some of it was probably just sightseeing. By the 5th– 4th centuries BC Greek intellectuals had a pretty good idea of Egyptian culture. They knew it was ancient (in fact they greatly overestimated how old it was), and they saw it as a source of knowledge and esoteric wisdom. Some of them believed that Egypt had influenced Greece in the distant past; for the historian Herodotus, Greek religion was mostly an Egyptian import. Flash forward to the Hellenistic period (late 4th– 1st centuries BC), when, following the conquests of Alexander the Great, Egypt was taken over by a Greco-Macedonian dynasty based in the new city of Alexandria. These Greek pharaohs communicated in Greek and the country itself became increasingly bilingual and bicultural, a process that continued into the Roman period. The most vivid symbol of the new Greco-Egyptian culture that developed is the popularity of Egyptian religion, particularly the goddess Isis, who had worshippers all over the Mediterranean by the 1st century BC. One big thing Egypt and Greece had in common was their passion for literature. Greek literature was comparatively young, attested from about 700BC (Homer, Hesiod), although the Greeks probably had oral literature much earlier than that. 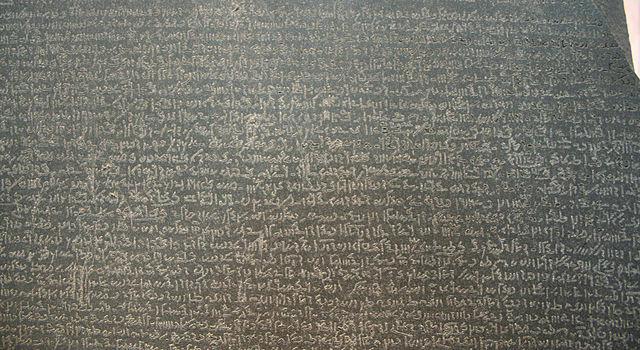 Egypt has one of the earliest attested literary traditions in the world, going right back to the 3rd millennium BC. British Museum Egypt by Einsamer Schütze. CC-BY-SA 3.0 via Wikimedia Commons. Once Greeks were settled in Egypt, they must have encountered Egyptian literature. There was no shortage of Egyptian literature being written and performed in this period, most of it in the later form of the Egyptian language called “Demotic” (which has a really difficult script). We wouldn’t know anything about this today, but luckily some of the papyrus-manuscripts have survived, or at least pieces of them have. Tremendous advances have been made in identifying and deciphering these in the last few decades, and for the first time we can begin to see what Egyptian literature was like in the Hellenistic and Roman periods. Some of it can be described as a literature of resistance. For most of the 1st millennium BC Egypt had been under the control of foreign powers, not just the Greeks, but the Persians in the 5th century and before them the Assyrians, and the popular literature imagines a world in which Egypt once had the upper hand, or will have again. A typical subject in Egyptian literature are the adventures of Egyptian pharaohs and other heroes battling against occupying enemies. A whole cycle of these stories centred around the pharaoh Inaros and his sons and their conflict with the Assyrians. Another national hero was the pharaoh Sesostris who was supposed to have once established an Egyptian empire larger than that of the Persians. There were also prophecies predicting a time in the future when the foreign occupiers would be gone. Besides this, there is also a lot of religious literature: for example, the so-called Story of Tefnut narrates how an angry goddess who has abandoned Egypt has to be persuaded to return; and the recently discovered Book of Thoth consists of esoteric writings related to priestly initiation. We know the Greeks knew this literature because some of it was translated into ancient Greek (the Story of Tefnut, for example). In other cases, an Egyptian work or genre may have been adapted by Greek writers; for example, the “Book of Thoth” could have been a model for the Greek mystical literature known as the Hermetica, i.e the works associated with the god Hermes, the Thrice Great (Thoth and Hermes were always regarded as equivalents). This process could also have happened in the opposite direction, with the Egyptian texts being influenced by Greek models. For example, some of the narratives associated with Inaros may have been somehow influenced by the epic poems of Homer. Mutual influence of this sort probably happened mostly in Hellenistic and Roman periods, but it is likely that already in the 5th century BC, Greeks such as Herodotus, were encountering Egyptian literary traditions, albeit in oral form. Headline image credit: Philae Temple HDR by Naguibco. CC-BY-SA 3.0 via Wikimedia Commons. 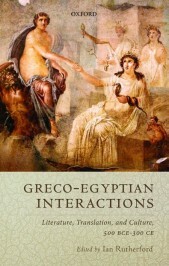 Ian Rutherford is Professor of Classics at the University of Reading, and the editor of Greco-Egyptian Interactions: Literature, Translation, and Culture, 500 BC-AD 300. Greeks didn’t have proper vessels. Egyptians could discover their coasts; however there were Phoenicians that you missed. They were controlling the all Mediterranean including Mycenaean area. People in Greece speak Greek language. The linguistic diversity of Greece is almost homogeneous according to a fractionalization scale which for Greece is 0.03. Christianity followers is majority among population. 77 of Greece’s population live in cities. This percentage comprises the urban population of Greece. According to data on inbound tourists in Greece, 17 920 000 tourists arrive in the country each year. Everyon knows the modern greek of today is a mixture of Macedonian, Albanians & Turks forced to become “Greek”. Yes I agree. Everybody knows that todays Greece is built on the remnants of those who were forcefully assimilated like the the Macedonians Of “Northern Greece” who were left after the majority were forced off their ancestral lands then replaced by the Christian Turks who were settled there in their place & the Albanians who made up the main population of Athens before it was rebuilt. Can, Dave and Pete your full of crap and so is this article. though the origin to what is called western civilization was given to the greeks for credit the real origin is the egytians. herodutous said in his book my travels in Egypt said the following and I quote him “All our culture even our religion comes from the egytians” further in the same book he describes the egytians and I again quote “The Egyptians have thick lips black skin and wooley hair” again his words> clearly African! It is in Africa you know?